Damage to landscapes from traffic can be severe during winter and especially now during the thaw. Soil conditions currently range from being frozen to partially thawed/frozen to thawed. Partially frozen soil will be thawed and very wet at the surface while being frozen at some depth below. Under this condition, soil and turf will be extremely vulnerable to shearing and rutting damage. Traffic, even light foot traffic, must be withheld when this condition exists otherwise severe rutting (soil displacement) will occur. Severe rut caused by a wheeled vehicle driving on partially thawed soil. Soil temperature has been “stuck” at freezing for some time now. Today is the first time this year that I have noticed the 2-inch deep bare soil temperature was above 33°F (> 35°F at the time of writing this post) at the New Brunswick Rutgers Gardens weather station. Interestingly, the 2-inch soil temperature under sod at this station remains only tenths of a degree above 32°F, illustrating the insulating effect that vegetative cover has on soil. Keep in mind that just because a soil has thawed doesn’t mean it is out of danger from traffic. At this time of year, soil will be very loose from frost heaving and very wet or saturated. Soil on very well drained sites will firm up sooner than poorly drained sites but all sites will be very susceptible to damage from traffic for some time after a thaw. Care should be taken to avoid traffic of any kind when the soil and turf is vulnerable. 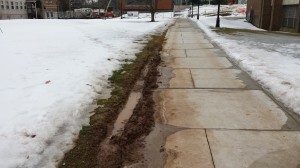 Allow soil to thaw completely and drain to at least field capacity (preferably drier) before allowing traffic on the landscape. Draining and drying will help to re-settle areas that frost heaved. Light-weight rolling may be need on soil that experienced extensive frost heaving and remains too loose after draining and drying.